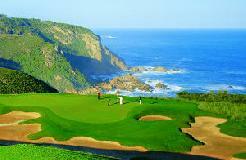 Oubaai Golf Course is situated only 8 kilometres from George. 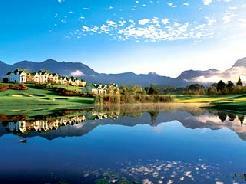 In the design of the Oubaai 18-hole Championship Golf Course and Driving Range, Ernie Els and his team have taken full advantage of the spectacular site they had to work with. Furthermore, they had the full support of Nicklaus Design as Technical Advisors. Nicklaus Design is the privately held company of golf legend Jack Nicklaus and the Nicklaus family. 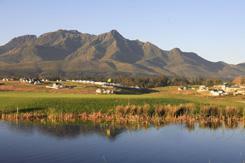 The resulting course is scenicly beautiful, challenging, yet a fair test of golf - with fantastic greens. 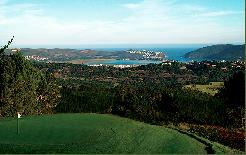 The dramatic Golf Clubhouse location overlooks the 16, 17 and 18th greens. Open air terraces offer panoramic views of the Indian Ocean and the Gwaing River Valley. 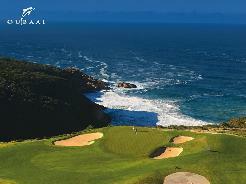 As you walk the course your views and outlooks take in forest, sea, river and mountain it is sometimes difficult to maintain concentration on your golf game when palying Oubaai. Ernie Els’s approach to golf course design is centred around flexibility. Concepts are molded according to the landscape and not vice versa. Ernie and his team have produced a course that is fun to play and that enhances the surrounding environment. 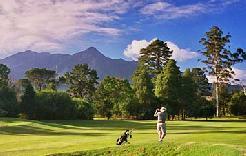 Furthermore the course fairly displays challenges and hazards whilst affording players the opportunity to use a full range of shots and plan strategically for individual holes. These concepts have been successfully applied to Ou Baai course and playing it, one is faced with many a challenge but none of them hidden from view in what are truly stunning surroundings. 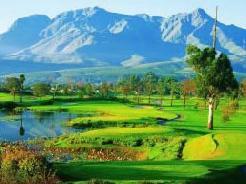 This is a golf course not to be missed.